We're busy packing up all of our loot this morning for our afternoon flight. I look forward to returning home after five weeks, and I can't wait to stop eating! Hashimoto Kansetsu Museum and Garden: A magical garden—I envisioned the peace I would have sitting among the plum trees next to the lazy brook, painting the ducks in the pond or drops of water falling from a leaf after a rain. The artist’s magnificent work immediately captivated me, his style being the subtle yet powerful manner of Asian art. I bought a print of one painting, a small puppy crawling over a bale of straw; the moment moved the artist as it would me. Gion Heihachi Shinsen-en: We ate at this fantastic restaurant located in a garden that dates back to 794. A beautiful setting for an exquisite meal of kaiseki (traditional Japanese fare). Sake Bar Yoramu: Yoram Ofer, the owner, hails from Israel but has been living in Japan for over twenty years. A true connoisseur of sake, he taught us more about sake than I’ll ever be able to remember. He also dispelled many sake myths, such as warm sake is bad or that sake can’t be aged. We sampled eleven types of premium sake, ranging in age from a few weeks old to nineteen years. Arashiyama: The Hozu River runs in this serene valley and our ryokan was located right on the banks of the river near the famous Arashiyama Bridge. Ogura Hyakunin Isshu Hall of Fame Shigure-den: The museum features “classical poets who transcended space and time,” who composed waka. Waka are classical Japanese poems with a structured rhyming scheme similar to haiku and written on a special paper known as shikishi. 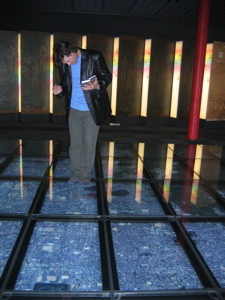 You begin your adventure by playing a game called karuta on a glass floor filled with screens. On your handheld device an image of a waka card appears, you then have to find the same image on the floor. I am proud to say I placed first both times! After the game a skyscape of Kyoto appears and you can choose locations you want to see and a bird guides you to it on the map. I was beginning to worry that the whole Sakura (cherry blossom) thing was a myth, a ploy to get tourists to Japan, sort of a version of the Loch Ness Monster to lure foreign visitors. 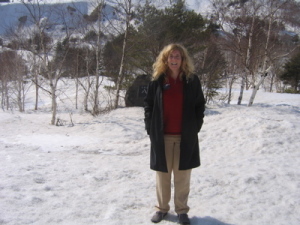 For four weeks we traveled hundreds of miles in Japan, only to be told at each stop that we had either just missed the blossoms or that it was too early for the bloom. The continued elusiveness aroused my suspicions. In Kyoto and Lake Biwa early this week, we finally struck gold (or more appropriately pink). While strolling down the Path of Philosophy in Kyoto, flowering trees greeted us at every turn, and fallen petals sailed down the canal in a regatta of pink. Later that night, we attended a special nighttime viewing of the sakura at Niji Castle, the lighted flowers shining like pink stars in the night. When the wind picked up, a rain of petals swirled around us. Hitoshi-san brought us to a splendid viewing sight on the shores of Lake Biwa, where we walked in the rain under a canopy of sakura, the pink blossoms heightened in color by the grey day. 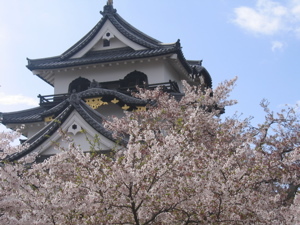 Also at Lake Biwa we visited Hikone Castle, the castle of castles in Japan. Shad finally got to explore the world of the samurai. Up and up we walked, and ascended stairs at nearly a 90 degree angle to reach the top of the castle tower (think of the golden staircase on Half Dome). Our reward—a sweeping panoramic view of the area, the landscape dotted with the heads of pink sakura. 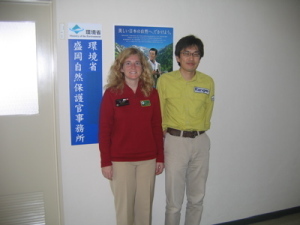 My thanks to Hitoshi for being such an excellent guide and friend! 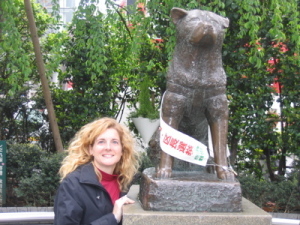 The “loyal dog Hachiko” is a beloved Japanese icon. Born in 1923, the purebred Akita would accompany his owner, Hidasaboru Ueno, to the train station every morning and wait for him to return in the afternoon. Ueno boarded the train one day in 1925 and never returned as he died of a heart attack. Hachiko, however, continued to wait at the station every day for ten years. A statue was erected at the station in 1934, and has become a landmark and popular meeting place. A kindly old Japanese man at the small Hachiko museum showed us the old photographs of Hachiko wandering the station and also of the grand funeral procession held when the dog passed away 1935. After his death his remains were stuffed and mounted and can be seen today at the National Science Museum in Tokyo. Even today his memory continues to be an inspiration. I watched hundreds of people—Japanese schoolchildren, teenagers, and adults, and foreign tourists from all over the world—pat the bronze statue as if it were a real dog and pose for photograph after photograph. After a three day whirlwind tour of Kyoto and Lake Biwa, Shad and I successfully navigated the Japanese shinkansen (bullet train) and subway system, and arrived in Tokyo last night. We’re enjoying our two days at the Park Hyatt, a premier luxury hotel, but we’re afraid we’ll be kicked out once they realize we’re only posing as rich people with the help of credit cards. I think it’s safe to say we have the lowest income level in this entire hotel-a Ferrari pulled in ahead of our taxi. Our room is the size of our house, the hotel displays more art than a museum, and the spa resembles a Roman palace. I think we can see most of Tokyo from our window and if it would stop raining, Mt. Fuji would appear. Dagoba chocolate and wine are complementary, and there is a television in the bathroom. I’m too busy swimming in the pool, getting shiatsu massages, and eating room service to write much about our adventures over the last few days, but check out the photo gallery for new pictures. If I have time after a swim and thermal wrap this afternoon, I’ll try to write more. We’re off this morning for a walk around Tokyo to find Hachiko! Farewell GSE Team, Hello Shad! Tonight marks the occasion of our farewell party in Morioka, and the official end of our program. Simply stated, it truly was the experience of a lifetime. My thanks to the Rotary family in both America and Japan who helped make this trip a reality and to our team leader Andy, and teammates, Alisha, Erin, and Aimee for enriching the experience with your companionship. 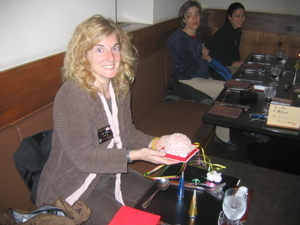 To Takashi-san:you organized a wonderful program full of fun surprises—Domo, Domo, Domo! 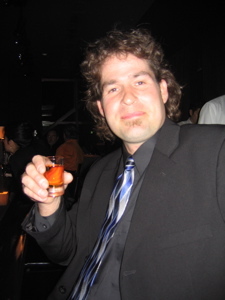 My one regret: I wish I could share some sake and laugh about my Japanese adventures with my late friend Steve Medley, who was so excited about my being selected for this program. Thank you, Steve. I miss you. Shad arrives tomorrow and we’re off to explore Kyoto for three days and then we move to Tokyo for a couple of nights. Shad, as seen here displaying his expert swordsmanship, is very interested in learning more about the Edo (samurai) period in Japan while I am looking forward to NOT eating anymore. I’m not sure if I will have internet access until we arrive in Tokyo, so wish us luck—I’ve been well taken care of this past month and I’m a little nervous about navigating in Japan on my own. We might end up in China. If so, please give Jack Bauer a call. For one of our professional exchange trips, we visited IBC, a local radio and television broadcasting company in Morioka and viewed the inter-workings of a media conglomerate. Our team member Alisha, who works as a newspaper reporter for the Sonora Union-Democrat, had the chance to chat with a newscaster and later was interviewed by another. During our tour of the facility, a cameraman followed our every move and later that evening my host family and I gathered around the television to watch my fifteen seconds of fame in Japan. 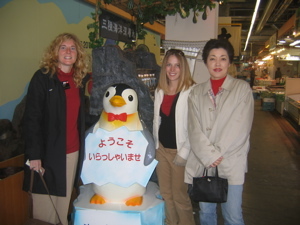 The home stays have been the most special part of our trip and have allowed us to not only experience the Japanese culture in-depth, but also to form life-long friendships. I will miss my last host family in Morioka and hope to visit them again someday. Norio Ogasawara, his wife Shoko, and their daughter Rie, all welcomed me as part of the family. Norio works as a real estate appraiser, while Rie is a doctor in Morioka. After a superb dinner of fresh sashimi and pink rice (in honor of the cherry blossom season), we stayed up late talking over many glasses of sake and ocha, and nibbling on desserts. Their home, built three years ago, combines traditional and modern elements. Beams of dark wood from their old home blend with the new, lighter woodwork. Shoko has a large outdoor garden with magnificent views of Mt. Iwate, and her hobby is ikebana (Japanese flower arranging). Rie spoke excellent English (which compensated for my poor Japanese) and I enjoyed our discussions as we had much in common given our similar age. No Japanese trip can be called complete without experiencing Wanko-Soba. A Morioka specialty, Wanko-Soba is more of a competition than a meal. This is the event we have been training for during our entire stay, the marathon of eating experiences. I felt well prepped for the event given that my stomach has stretched considerably from our massive food consumption. “Wan” means cup in Japanese and the “ko” is added for flair. The game involves swallowing cup after cup of mouthfuls of soba. Although the exact origins of the game remain unclear (maybe a Japanese college fraternity? ), it became popular after WWII. After donning an apron, we sat down and read the booklet outlining the rules. We gazed around at our other customers, feeling some trepidation after viewing the stacks and stacks of bowls. Takashi observed that the waitresses all looked cute, but they would soon seem evil. The waitresses soon arrived carrying trays of small bowls and the games began once they started pouring. I had a difficult time adjusting to the trick of swallowing the noodles without chewing (picture swallowing spoonfuls of spagetti whole) as it allows you to eat more. Cup after cup arrived, and the once seemingly innocent servers did began to appear malicious, taunting us after every cup with, “are you sure?” The rules do not allow them to stop, even if you say “enough”—you have to cover your bowl with its lid to end the agony. Takashi had told me the average Japanese person can do 60 bowls, and I figured I at least had to reach that goal, which I did with considerable strain. In the Wanko-soba world, I was a lightweight. Takashi consumed 90, and some teenage boys at another table put away 120 each. Even a small boy had three stacks in front of him. The all time Wanko-soba record holder ate 345 cups—inconceivable to me. I thought I would not eat for the rest of the week, but an hour later I had a matcha tea soft serve ice cream. I compare discovering new writers to making new friends, and I have found an incredible new “companion” in the Japanese artist Kenji Miyazawa. I began reading his story “Night of the Milky Way Railroad” early in our trip, along with some of his poetry. An evocative and imaginative writer, his prose paintings propelled me to the place of my dreams—a world of mystery and wonder. We visited the Kenji Miyazawa Museum in Hanamaki City, which allowed me to learn more about his life. He reminds me of a peaceful, more meditative version of Jack London, as both men exhibited extreme genius in a variety of areas. Not only did Kenji write stories and poems, he painted, composed music, studied religion, and advocated for poverty-stricken farmers. His scientific pursuits included work in geology, astronomy, and natural history; most remarkably he had predicted global climate change and promoted renewable energy during his life, definitely ahead of his time. As his biography states, his vision was “a mixture of religious faith, scientific knowledge and environmental awareness.” He died young (similar to Jack London), at the age of 37 in 1933. The district conference brought over 1,000 people from the Iwate and Miyagi prefectures, many from Rotary Clubs we had visited during our stay. We had many fun reunions with friends we had made during our travels: my host father from Miyako brought me a beautiful card, Satoshi from the GSE team gave me a handcrafted bookmark for a belated birthday present, and other friends came by too many times to count to fill my sake glass (I don’t think I will ever have to buy my own drink in Japan!). I have always been very comfortable with public speaking, and have spoken before larger crowds before, but giving a presentation to 300 people in Japanese certainly ranks as my most challenging engagement. I liked it when the interpreter had to translate my bad Japanese into comprehensible Japanese. This morning we attended the formal meeting, which began with about an hour of introductions. Although I understood only about one word in fifty, I enjoyed listening to a powerpoint in Japanese and was able to derive a vague notion of its content by the speaker’s manner and technique. Now I know how most people feel when looking at one of my financial presentations. Our hotel has nice views of the Kitakami mountains, and I ran for an hour along the Kitakami River this afternoon, savoring the warm day. I met a few herons and ducks, but no dogs. Yesterday, I had the experience that marks the highlight of my trip. On a walk through the neighborhood next to the hotel, I passed a playground. The children began yelling “hello, hello” and I returned with a few Konnichiwas. They followed me excitedly down the street, calling “hello,” and I stopped and gave them all Yosemite stickers and asked them their names. 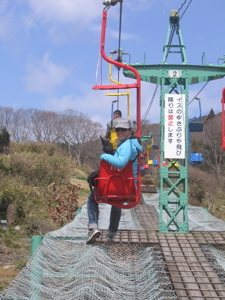 For me, the most lasting memory of my Japan trip will be the children’s beaming smiles and echoing laughter. Tomorrow we travel back to Morioka for our final week. Today during our bus ride our team brainstormed some of the things that surprised us about Japan. I offered my observation that the entire country must be suffering from undiagnosed dehydration as nobody drinks water (mizu). My frequent requests for water have been the object of much amusement to my hosts and are always accompanied by a look of amazement. As the Japanese are among the healthiest (if not the healthiest) people in the world they must be doing something right, but I’ve felt like I’ve been dying of thirst for most of this trip. I had always considered the Japanese to be at the forefront of technology. Although it might be different when I visit Tokyo, I have yet to see anybody with any of the newer versions of PDA’s such as Blackberry’s or Treo’s, and observed the first user of a Bluetooth headpiece only today. Almost none of the homes have Internet access, and iPods, so ubiquitous in America, are not prominent here. Another surprise: coffee has also replaced tea for many people as the morning drink. I expected to be in green tea heaven in Japan, but most of my hosts have brewed coffee in the morning. Even a few coffee shops in Morioka did not sell Japanese tea (Nihon ocha). Since it’s such a staple drink, however, many stores or tourist sights will offer it for free, so I come out way ahead—in the states I’d be paying $3.00 for a cup of tea at Starbucks. Eating and drinking can be quite exhausting. Although I have no complaints, and am having the time of my life, our days during this exchange begin at 6:00 am and I am usually not asleep until just before midnight. Even for a workaholic like me, this can prove tiring. 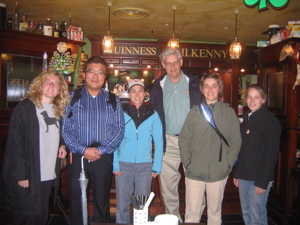 Our coordinator in Kurikoma, Hiroshi Sasaki, had led several exchange groups to other countries and knows the routine. He won us over immediately when he stated, “the theme for the next two days is relaxation." He hates meetings and when he took teams overseas he bemoaned the lack of free time. He brought our team to the Kurikoma onsen resort near Mt. Kurikoma, where we luxuriated in the natural hot springs, heated pool, and really awesome massage chairs. The first evening we watched a dance theater performance by a family troupe that travels from spa to spa. Hiroshi interpreted some of the songs for me, and also told me a little about the family—all the performers were male (which did not diminish their believability as geishas), and the younger boy had just recovered from brain surgery for cancer. The lively, colorful dances blended traditional with modern, and added a comedic flair. Later, I stayed up talking with one of the rotary members, an affable young man who drove a Chevy because he likes its “wildness”; he had lived in Los Angeles and San Francisco. The evening also marked the occasion of my reaching my sake limit, which of course had unwelcome consequences. 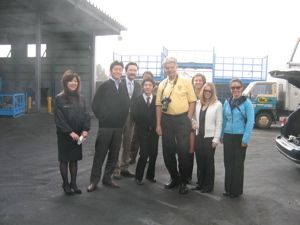 After our presentation to the Wakayanagi Rotary Club, we visited the site of an automobile recycling company in the area. The new facility handles over 3,000 cars a month, and we all watched with fascination the various steps in the dismantling process, which ends with a car being compressed to a block of steel the size of a couch. It was the cleanest, most organized auto parts yard I’ve ever seen, and the company has also enjoyed enormous success, which again demonstrates the effectiveness of the Japanese commitment to process. Tip of the day: make sure you travel across the date line for your birthday. You can technically celebrate twice, maybe three or four times if you get really strategic. Our GSE leader in Japan, Takashi-san, staged a surprise birthday party for me in Sendai and he traveled from Morioka to help me celebrate. His thoughtful gifts included a collection of Godzilla toys, a Shinto back massager, and without question the most beautiful and delicious birthday cake I’ve ever had— a mountain of sakura (cherry blossoms) made from sweet bean paste of many colors. Right before I went to bed, my fellow GSE team members presented me with their own very thoughtful gifts—coupons good for one day of luggage transport (worth its weight in gold), a mochi breakfast, a sake drink in California, countless belly laughs, and a running partner. Certainly it will be very hard to ever match my special Japanese birthdays! (Hint to Shad).